(Bloomberg) — Bank of Canada Governor Stephen Poloz said he expects the nation’s high household debt levels will persist for years, leaving the economy more sensitive than before to interest rate increases. In a speech on balancing risks associated with household debt levels with the need to raise interest rates, Poloz said that while interest rates are bound to move higher, the central bank needs to worry about the “sheer size” of the debt and is closely watching the impact of higher borrowing costs on the most vulnerable households. While recent steps to tighten mortgage rules were welcome, he added, the measures will only impact new mortgages. Household debt “poses risks to the economy and financial stability, and its sheer size means that its risks will be with us for some time,” he said. The old debate about whether central banks should raise rates to counteract housing bubbles and high debt has been finding new life in Canada as the country copes with a recent surge in home prices. 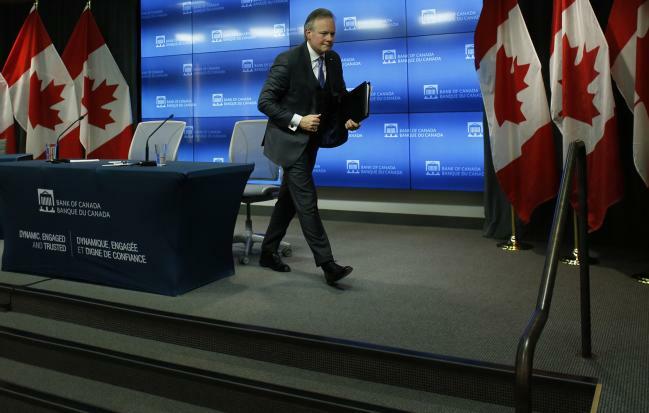 The Bank of Canada has been under some pressure to raise interest rates more quickly to stem the buildup of borrowing.Poloz however has been warning for years that hiking too quickly could aggravate financial stability risks given the high levels of household debt in the economy. Even with that caveat, Poloz reiterated the central bank is becoming more confident that less monetary stimulus will be needed over time. The Bank of Canada has already raised borrowing costs three times since July, bringing the current policy rate to 1.25 percent. The governor also reiterated that various forces restraining the economy — he cited U.S. trade policy, Nafta negotiations, and competitiveness challenges — are keeping the policy rate from rising to its neutral level, which the central bank estimates is between 2.5 percent and 3.5 percent. “All this to say that we are becoming more confident that the economy will need less monetary stimulus over time,” Poloz said. Still, it will take time for the central bank to determine how much of an impact the three rate increases July will have on the economy, though the central bank is already seeing evidence higher interest rates are moderating borrowing growth. Poloz said it’s a balancing act for policy makers. “Moving too slowly would mean a further accumulation of household debt and rising vulnerabilities, while moving too quickly could trigger the sort of financial stability risk we are trying to avoid,” he said. Macroprudential policies — essentially government regulations to slow accumulation of debt — improve the “trade- off”, he said.